The most important term in the equations both for /f-values and relative volatility is the vapor pressure term. Effect of temperature or pressure. This effect can be illustrated with the aid of a Cox chart (Fig. 1.2a). This chart shows a steep increase of vapor pressure with temperature. For this reason, the Jf-value for each component increases steeply with temperature. 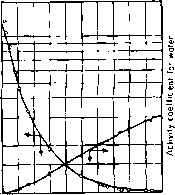 The Cox chart also shows that in general, for members of a homologous series, vapor pressure of the less-volatile component increases faster with temperature than the vapor pressure of the more-volatile components. This causes p'r in Eq. (1.13a) to diminish as temperature is raised. As the critical point is approached, the ratio pr approaches unity. Applying Eq. (1.12), relative volatility decreases as temperature is raised, until it approaches unity as the critical point is approached. The above trend is valid for members of a homologous series. 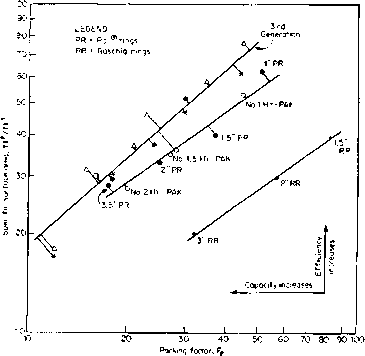 For components which are not members of a homologous series, the reverse trend may occur over a limited temperature range, causing relative volatility to increase as the equilibrium temperature is raised [Eq. (1.12)3. However, as temperature is raised further and approaches the critical point, relative volatility eventually diminishes and will reach unity at the pseudocritical point of the mixture. where 0.08 < q < 0.11 with a mean value of 0.09. The effect of temperature (or pressure) on relative volatility is further illustrated in Fig. 1.26 (29). The diagram clearly shows a reduction in relative volatility as pressure is raised and illustrates that relative volatility approaches unity as the pseudocritical point of the mixture is approached. Effect of composition. The main effect of composition on if-values and relative volatilities is a result of the effect of composition on the liquid activity coefficient. Composition also has an effect on the fugacity coefficient. The latter effect is generally small at low pressures. Figure 1.3 Effect of composition on liquid activity coefficients. (Fig. 1.36); the deviations are negative and K-values are lower than those obtained from Raoult's law. The magnitude of the deviations from Raoult's law increases with the difference in nature between the components. For instance, the normal propanol-water system (Fig. 1.3a) and the acetone-chloroform system (Fig. 1.36) show large activity coefficients, the highest being 13. On the other hand, the highest-activity coefficient in a mixture of isobutane-normal butane, which are similar to each other, is smaller than 1.1 (at about 100 psia). Figure 1.4a and 6 shows the effect of composition on the activity coefficient ratio. According to Eq. (1.12), this ratio represents the main effect of composition on relative volatility. When a system shows positive deviations, relative volatility decreases as the concentration of the MVC increases. The reverse applies for negative-deviation systems. Phase diagrams are used to describe binary systems by plotting two out of the three variables—composition, temperature, and pressure, at a constant value of the remaining one. The most popular of these plots are the T-x plot and the x-y plot. The x-y plot was described earlier (Sec. 1.2.1, Fig. 1.1). 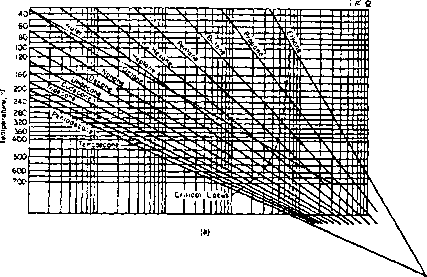 Temperature-composition (T-*) diagrams (Fig. 1.5). Curve ABC shows the composition-temperature relationship for the saturated liquid. 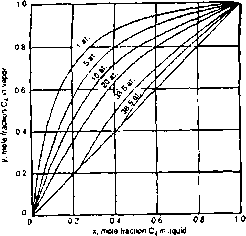 At temperature and liquid composition xu point B is the condition at which the liquid is ready to start boiling. Point B is termed the bubble point. When the liquid starts to boil at temperature Tl (point B), the first vapor formed has a composition ^ and is therefore at its dew point. At this point, the vapor is as rich in the light component as it will ever be. As temperature is further raised, more of the heavier component is boiled off. The quantity of vapor formed increases, but the mole fraction of the light component in both vapor and liquid drops. At temperature T2, the liquid composition is x2 and the vapor composition is y2. Some of the initial charge is now vapor and some is liquid. A further increase in temperature to Ts will vaporize the rest of the liquid. The vapor composition will now be xu and the last drop of liquid vaporized has a composition xs. The liquid always travels along its bubble-point curve (BEH) while the vapor always travels along the dew-point curve iDFG). Therefore, in distillation, bubble-point liquid is always in equilibrium with dew-point vapor. 0.2 0.4s x, mole fraction"
How does temperature effect volatility? What is a cox chart of relative volatility? How does a halogen affect the homologous series? What is effect on relative volatility with temperature and pressure? Can the volatility of a substance be affected by temperature? How does water affect volatility? How does temperature affect volatility? Does relative volatitity change with temperature? How does temperature affect volatility chemistry?